My memories of being in and around the water start at about age 5 when I was taken to weekly swim lessons at the Y. Yes, I sure did like the water. Even more, I liked getting a 5-cent Coke from the old chest type vending machine after each lesson. A few years later, my dad had a pool built in our backyard, so he wouldn’t have to take us on vacation. I would try to stay in the water the longest, and I loved to swim underwater and pretend I didn’t hear my folks yelling that it was time to get out of the pool. In adulthood, I’ve loved my tropical vacations, especially Hawaii — I’ve been to the Big Island of Hawaii, to Maui, to Kauai, and 3 times to Oahu. I’ll elaborate on my visit to the Big Island — my ingenious companion Scott got the idea that we’d rent a van in lieu of hotels/rental car. 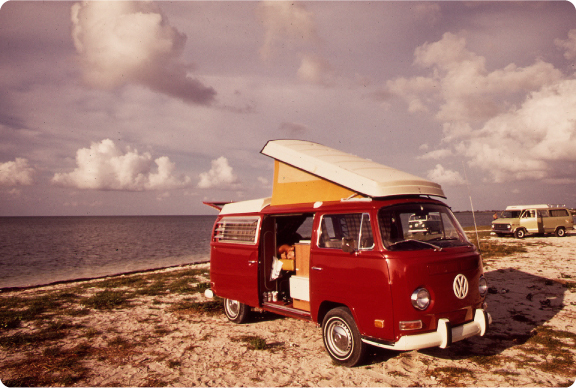 We ended up having more fun than imaginable touring the island in our VW Westfalia camping van named “Rosie”. Rosie had a two-burner propane stove and a sink, and came equipped with pots, pans, dishes, cups, and many other essentials. We kept food in a cooler with ice (had to buy bag or two of ice everyday). It was lovely not to have to plan our days around the usual requirement to be somewhere near food at mealtimes — we would just cook up something wherever we happened to be. We drove Rosie to locations that had toilet & shower facilities, and were lucky enough to find places to stay at uncrowded beaches where we were practically at water’s edge with fantastic views of the surf — closer to the ocean than people in the high-rise beach-side hotels who were paying top dollar. We made it around the island 1-1/4 times. The total cost for both of us for a week was about $2,000, including airfare. I didn’t get sunburned and I didn’t gain or lose weight. Bottom line: This vacation was just about the best I could ever hope for. To wrap it up and put a bow on the subject of terrific vacation destinations, I’m echoing all the other MoveGirlGO contributors this week and hereby declare the clear favorite to be the Hawaiian Islands.